"I'm not a murderer," the man in the trailer says, mere moments before setting off on a murder spree notable for both its creativity and staggering number of victims. But is it murder if the victims are already dead? These are the questions that Dying Light , Techland's upcoming zombie game, may or may not inspire you to ask yourself as you bury your hatchet into the forehead of a staggering, shambling creature that used to be somebody's mother. 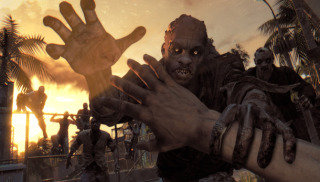 Zombies aren't the most original material to mine for a videogame, especially for Techland, the team behind Dead Island. But I dig the Mirror's Edge-esque parkour angle, and I'm also taken by the idea of a day/night cycle that turns "the infected" into far more dangerous and powerful threats when the sun goes down. Classic zombies by day, fast zombies by night; it's a good reason to stay inside when the sun goes down. The new video also touches a bit on themes highlighted by the " Humanity " trailer released in April, a sombre reminder that before they turned, zombies were people too. That in turn had echoes of the famous Dead Island announcement trailer from 2011, which doesn't necessarily work in Dying Light's favor: That Dead Island video is quite possibly the most stunning piece of videogame PR I've ever seen, but was completely unrepresentative of the actual game. So is it true that, as Judge Death says, "You cannot kill what does not live"? Or do you bear some moral burden for ending the "lives" of even those inhuman creatures in order to maintain your own? Eh, whatever. Let's shoot zombies! In 2015, that is, when Dying Light is scheduled to launch.